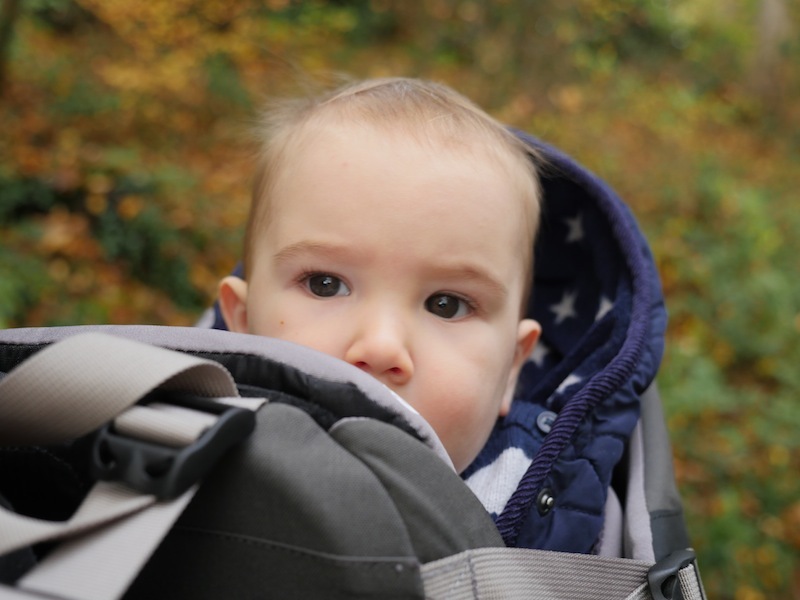 My LittleLife All Terrain Carrier review, a baby carrier for babies from 6 months until 3 years. I’ve been a big fan of ‘baby wearing’ ever since George was born. 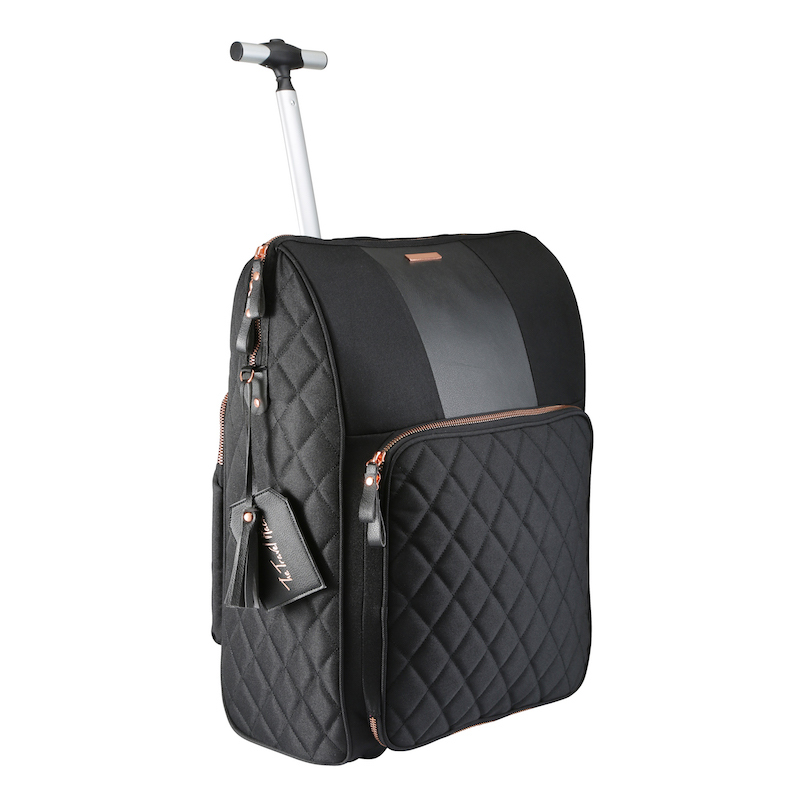 While I love strolling around with our trendy Bugaboo, I prefer the freedom of carrying him while we travel. A pushchair can be restrictive and bulky and means you can never get off the beaten path, stroll along the beach or go for a hike. Pushchairs can even be annoying on busy streets and tiny shops too. When George was teeny tiny I used the Lalabu Soothe Shirt to carry him everywhere. Once he got a little bigger we upgraded to the Pao Papoose by We Made Me. Now he’s bigger again and we’ve had another upgrade to the LittleLife All Terrain Carrier from Gap Year Travel Store. This isn’t an everyday carrier like the Pao Papoose, it’s more for outdoorsy activities like country walks. 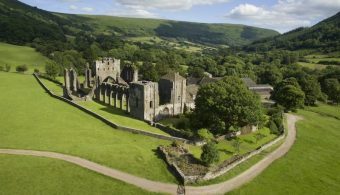 As we live in the countryside and regularly walk our dog through the fields, it’s getting a lot of use! What is the LittleLife All Terrain Carrier? 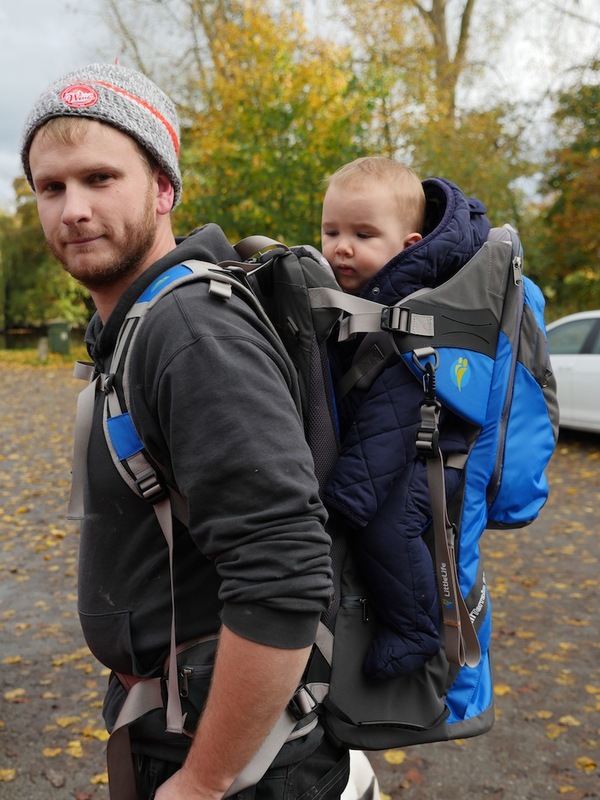 The LittleLife All Terrain Carrier is basically a backpack for a baby! You wear it like a backpack and place your baby inside. There’s a perfect seat and a headrest so Baby is comfortable and happy. This is of course the best thing for us – George absolutely loves going in it. As soon as we get it out he starts laughing and clapping his hands. He loves being high up and looking over our shoulders and being eye level with adults. He does his best to stay awake while he’s in it but he’s usually fast asleep within 20 minutes. There’s a little head/chin pillow attached so when he does fall asleep he has something comfy to rest his head on. The fact that he falls asleep is a real bonus for me because he isn’t the kind of baby to fall asleep anywhere. He only naps when he’s really happy and comfortable, proving he definitely likes this carrier! There are numerous straps and clips and buckles to make sure Baby is safely strapped in and can’t wobble about. George feels very secure in there and I don’t worry about him lurching around. His torso is fairly restricted but I think because his arms and legs are free he doesn’t feel trapped in there. There’s also a space at the front of the carrier to place your foot in when you’re placing your baby inside. This stops the carrier from falling over and makes it easier to get them in and out when you’re on your own. There are extra handles on the bag that at first seemed like random straps but I soon realised they’re for getting the carrier onto your back without swinging it around. If you had a heavy backpack you’d swing it up onto your back but you obviously can’t do this when you’ve got a baby inside so these straps really help. I love the fact that you can also use the LittleLife All Terrain Carrier as a backpack – and it causes no discomfort to the baby. There are also plenty of pockets on the sides for drinks and snacks and all those things you need when travelling with a baby. George weighs around 10kg so he’s a hefty little thing to carry around. Thankfully, it’s really comfortable to carry him in the LittleLife All Terrain Carrier. Sam is perfectly comfortable carrying him around for a couple of hours. I’m a lot smaller than Sam (5”3 and slim-medium build) and I struggle to carry him for more than half an hour. That’s fine for me as I usually use it when we’re walking the dog and Sam carries it for the longer walks. The LittleLife All Terrain Carrier is also easily adjustable so it’s perfect if you’re swapping between mum and dad. We obviously try not to take George out for hikes in the rain but this is Britain after all so we’ve had plenty of use out of the rain cover. The rain cover the for LittleLife All Terrain Carrier is great as it tucks away inside the bag and easily whips out when you need it. The sunshade pops up (not that we’ve had much use for that) and the rain cover fits snugly over the top. The rain cover has kept George dry in downpours of rain, in the snow and in hail. While we’ve been feeling the wintry weather, George has been snug as a bug. That gap at the bottom of the carrier at the front is a space to place your foot to balance the carrier and make sure it doesn’t topple over when on the floor. The carrier has a mirror attached to it so you can check on your little one like rear-view mirror. This comes in surprisingly handy when you’re on your own and you don’t know if they’re asleep or not. It says it can be used for babies aged 6 months and up but it really depends on their size. George is tall so he was in it from around 5 months. My niece is currently 7 months old and she’s a dinky little lady and the carrier is still too big for her. It also says it can be used for up to 3 years but there’s no way I could carry a 3 year old in this. The carrier is enormous and takes up a lot of space in the car or in your home. There’s not a lot LittleLife can do about this so this isn’t a complaint, it’s more just an FYI. The LittleLife All Terrain Carrier is currently priced at £149.99 in the Gap Year Travel Store. Great article feeling very great after reading this whole post and baby’s smile is just awesome.